This Item only works with Webkul’s WooCommerce POS System. Hence the POS Plugin is Required, to make use of this Plugin. To make an e-commerce business more profitable, proper pricing and discounting strategies must be acquired by online retailers. 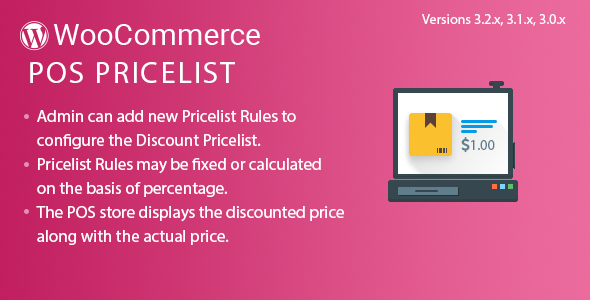 WooCommerce POS Pricelist provides the feature using which better discounts may be allocated to a product in a POS store. Customers always seek products with favorable discount options and tend to purchase products which offer heavy discounts. This generates more traffic, which in turn would generate good revenue for the webstore. For an online webstore, WooCommerce POS Pricelist is a powerful discounting tool. It provides various discounting features which can be applied to particular products or on all products of the store. The discounted price is displayed along with the actual price on the POS, to notify customers about the discounted product. Admin can add new Pricelist Rules to configure the Discount Pricelist. Pricelists Rules may be defined for Product, Product Category, Product Variation and for Global Products. Discount may be applied to a specific category or specific product or to a particular variation. The Pricelist Rules may be fixed or calculated on the basis of percentage. Admin may define the start and the end date for the Discount Pricelist. The POS store displays the discounted price along with the actual price. The buyer can easily differentiate between the discounted product and non-discounted product.